In November, you can expect a new name, new visuals, and a redesigned web app completely from the ground up. EEBA is becoming Goodbudget. EEBA is like a maze. There’s like ten different links to get to important parts of the app. Regular envelopes, annual envelopes, and accounts are all on separate pages. Truth be told, we’d get lost in the app sometimes, and we built the thing. Goodbudget is worlds better because everything is all-in-one-place. In EEBA, you had to click on a different tab to do anything or get anywhere. Not so in Goodbudget. As you can tell from this pretty screenshot, everything is accessible from the homepage. Want to see how much you can spend on groceries? On the homepage. Want to see all your transactions? Also on the homepage. Want to fill your envelopes? Yeah, you can do that from the homepage too. The two things our users do the most are add transactions and fill envelopes. In EEBA, adding transactions and filling envelopes were buried on different pages and hidden among a sea of gray text. 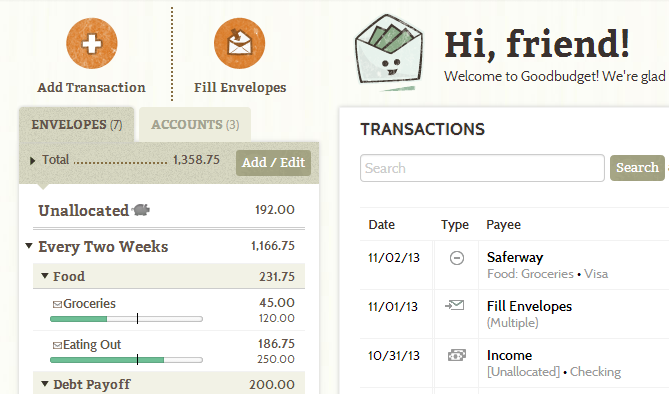 In Goodbudget, we’ve brought out the Add Transaction and Fill Envelopes actions front and center (well, to the left) making it easier to do the things you do the most. A maze is fun if you’re hanging out with your friends, but not when you’re adding a grocery trip transaction. In Goodbudget, there’s no more hard-to-navigate maze. Everything you want to do is always right there. You are always on the right page. Questions? Feedback? Leave a comment below. We’re always listening. Will there be a way to link my account to my debit card to to track the spending? @Patrik – In Goodbudget, you tell it what your bank balance is, and then every time you record an expense, your account balance is updated. Goodbudget does not link directly with your bank. Hope that helps! @Charlotte, Sorry about that! Screenshot should be fixed now.